Ready-made concrete molds can help create ornate markers. 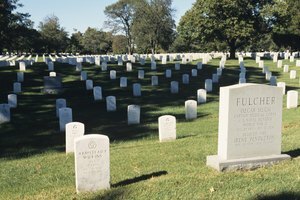 Buying grave markers made of granite or bronze can be expensive, and headstone designers may charge by the word for engraving. 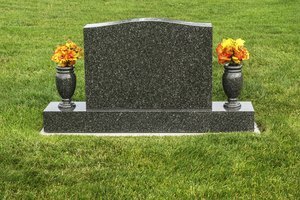 But expense isn't the only reason to seek an alternative to purchasing a tombstone -- a homemade marker presents a chance to create a personalized memorial. If you plan to mount the cross in a cemetery, talk to the administrators to find out you're allowed to provide the marker, and if so, the allowed dimensions. The regulations vary from place to place. Decide how tall to make the cross, in accordance with any known regulations. Add 1 foot to your height measurement to ensure there's enough board to secure the grave marker in the ground. Cut one 2-by-4 board to this length, and the other to half the length. Cut the longer board into two pieces of different sizes -- one piece should be approximately 1/4 of the total length, and the other should be the remaining 3/4 of the total length. Arrange the pieces of the cross, placing the short piece from step 2 vertically at the top, and the long piece from step 2 vertically directly underneath. Leave a 4-inch gap between the bottom edge of the short piece and the top edge of the long piece. Place the shorter piece from step 1, the piece you didn't cut, horizontally between the two arranged pieces of wood. Adjust each piece so that the top and bottom vertical pieces are flush against the side edges of the horizontal middle piece, approximately in the center. Assemble the pieces using finishing nails. Create a point at the end of the cross that will be pushed into the ground by sawing two angled cuts that meet at the bottom. Stain or paint the cross as desired, and seal the finish with weather-resistant lacquer. Allow it to dry completely before placing the grave marker. 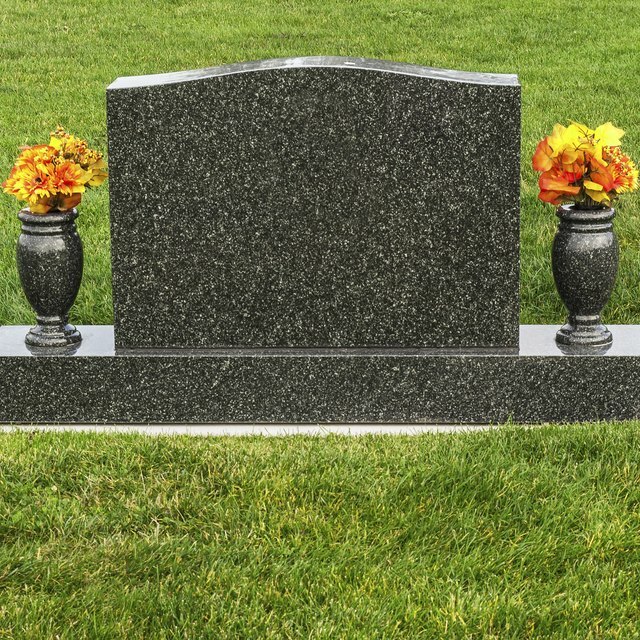 If you plan to put the headstone on a grave within a cemetery, contact the location's administrators to find out you're allowed to provide your own markers, and if so, what the guidelines are for size and shape. These will differ between cemeteries. Determine whether you wish to make a square or rectangular headstone, and what the dimensions will be. Cut two identical 2-by-4 boards to the exact desired width of your headstone. Cut the other two 2-by-4 boards so that they are each 4" longer than the desired length of your headstone when finished. Assemble the wooden frame. The extra allowance of the length-side boards is to accommodate the width-side boards, which should just fit inside them. Secure the boards together with screws. Spread a plastic tarp over a flat, level surface. Place the prepared frame on top of the tarp and make sure there are no wrinkles in the plastic. Prepare the mortar mix in a 5-gallon bucket, following the directions for your particular product on how much water to use, as this varies with the manufacturer. Mix the mortar using a shovel until the consistency is uniform and resembles very thick cake batter. Scoop the mortar into the frame using the shovel, filling the frame evenly up to the top edge. Smooth the surface of the mortar with a leveling towel. Trowel from edge to edge in straight lines moving in one direction, and then repeating in the opposite direction. Gently tap each edge of the frame with a rubber mallet, and trowel the surface again. Use a 2-by-4 board nearly as long as the width of your frame to screed the surface and release excess moisture. Smooth the surface with the trowel one final time. 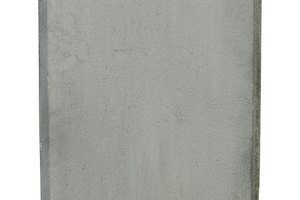 Arrange concrete stamps carefully next to your frame, in the order that they will be used. Triple-check to ensure that all of the information is laid out as you wish it to appear, and that everything is spelled correctly. Lay a straight edge across the frame as a guide. Dip the first concrete stamp into a bowl of water before pressing into the surface of the slab. Use moderate, even pressure to make the imprint. Lift straight up on the stamp, and then immediately rinse it to remove traces of mortar. Continue making all of your letters just as you did the first. Press any decorative items you wish to embed in your marker around the edges. 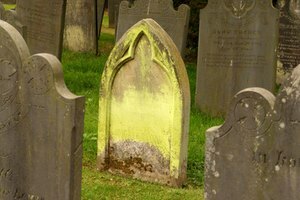 Once you are happy with the appearance of your headstone, allow it to dry for 48 hours. Unscrew the frame from around your grave marker. With help, carefully lift and move it to its permanent location. Decorate around the marker with stones and plants. Did you recently lose an animal companion? Consider pressing their tag, feather, or other small items into a poured mortar grave marker before it sets and remember all of the good times that you shared. Always use caution and wear proper protective gear when using power tools. Cover your body well and wear plastic gloves when handling wet mortar. 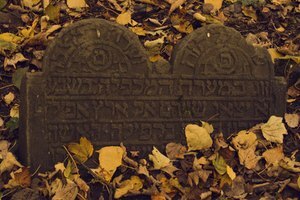 Cremation Resource: How is a Headstone Made? Townsend, Jourdan. "How to Create Grave Markers." Synonym, https://classroom.synonym.com/how-to-create-grave-markers-12086090.html. 29 September 2017.